I’ve been out of action for a couple of weeks, but nothing could stop me going to Arbroath today with Kay Anderson, a tireless basketry champion in Scotland for at least 30 years. Kay lived in Arbroath for many years. 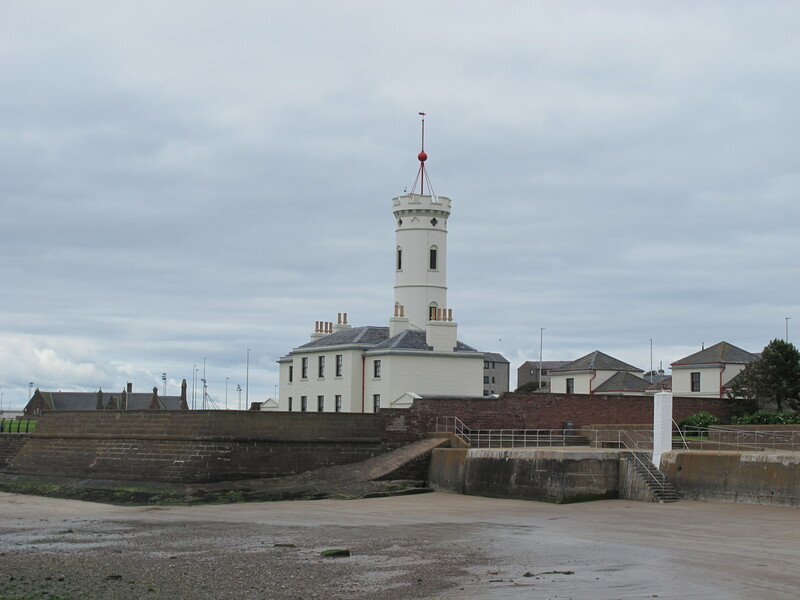 She is very familiar with the Signal Tower collections, and also with local fisher families, and she still runs sessions for the museum. Both Colin Easton (Curator for the Signal Tower Museum), and John Johnston (whose curatorial role seems to cover the whole of Angus) had been very helpful, John going so far to bring in many baskets from elsewhere for our visit. The baskets here are all local, and reveal the Arbroath basketry form which is so distinctive to the region. This is quite possibly due to the influence of just one or two local makers in the past, Peter Lindsay being one of the most notable. There were three main type of local basket to see. Firstly there was the fisherwoman’s rip or ‘creel’, which is a frame basket with two side slits for carrying. Into these slits a woven string cord strap can be attached, which can go across the chest and enables the rip to be carried on the back. There is one of these on display on the stairs in the museum and another in store. 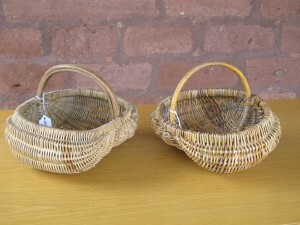 There were also several fishwive’s hand baskets, sometimes called ‘bow creels’. These are also frame baskets, but with handles. They were used along with rips in this area when the fishwives went around the region to sell fish. They have a very characteristic oval form, which enables then to be rested on the hips, if wished, and which has also earned them the name of ‘buttock basket’ among outsiders and in the USA. Most poignant of these were a pair of small bow creels give to the donor’s mother, one when she was four in 1896, and a second when she was five, according to the Museum notes. One interesting aspect of this collection is the handwritten acquisition book, which has excellent notes, although I was warned that some of these may have be a little inaccurate. As well as the above baskets, there was a general round fishing basket full of lines and a painted black wicker ball, which hung from a boat’s mast and indicated what kind of gear the boat was carrying. 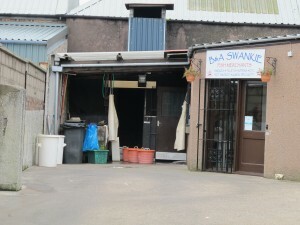 On my way home, I walked past Swankie the Fish Merchant’s yard. The demise of the woven basket was plainly visible in their orange plastic replacements now in use.